The S9B Clamp (sometimes referred to as a phase or conductor clamp) is precision manufactured from a robust aluminum casting with stainless steel fittings at our manufacturing plant. 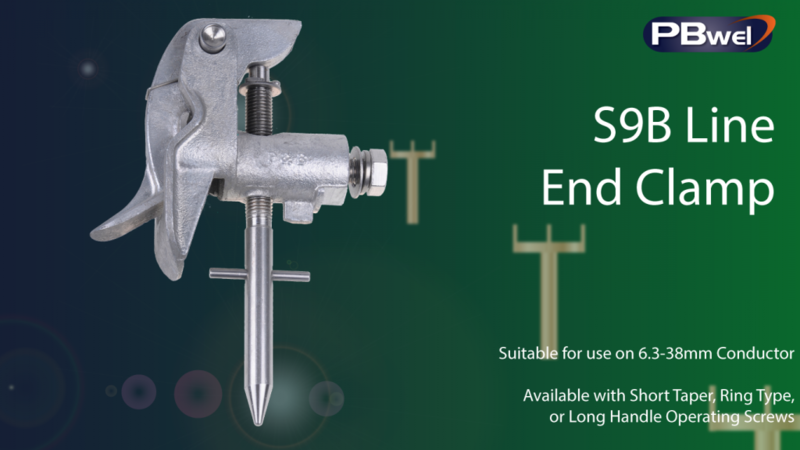 The S9B line end clamp is designed to hook onto the conductor to become self-supporting whilst the operating screw is tightened or loosened. For an alternative method of applying the portable earthing clamp, PBwel’s CE62 Snap-On clamp is also available. The S9B clamp is available with a short, tapered ring type or ISO style operating screw and is suitable for a conductor range between 6.3mm and 38mm diameter. All clamps are designed with the ultimate strength well in excess of normal working loads and are tested at normal loading before being approved for production.